SAVE THE DATE : Thrill the World Carbondale 2018, October 27 at 4pm. At the Carbondale Branch library. Thrill the World Carbondale 2018 zombies have been on the move in Carbondale since October 1st, flashmobbing randomly in town. Why??? To share and celebrate dance performance, community and Michael Jackson with all of you. 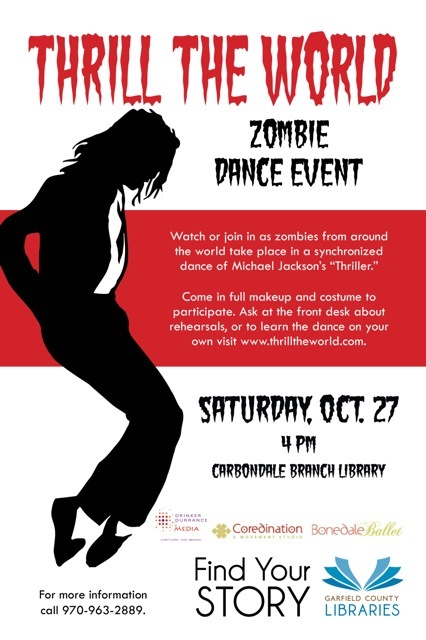 *Next Saturday, October 27 at 4pm is the main event in which our community of zombies will dance at the same hour as the rest of the world in this synchronized dance event. Join us for this spooky dance celebration! *Warning...be on the lookout for zombies tonight at the Bonedale Zombie Pub Crawl tonight in Carbondale. Jazz Modern dance class for Kids- Sign up now!